If you like this stuff, sign up as a follower. The only way that the tens of tons of uranium and plutonium shown by US EPA air samples could occur was if the explosion came from within the reactor vessel, and/or spent fuel pool. So clearly the explosion was a nuclear type of explosion from within. Nuclear promoters have long stated that nuclear plants can't blow up in a nuclear explosion. We know this to be a lie. In fact Chicago's own Argonne National Lab has video from back in the day when it was "cool" to perform open air tests to blow up reactors to prove the nuclear chain reaction can blow up the reactors. The special type of Nuclear Explosion is called a "prompt moderated criticality". A blast from a "hydrogen explosion" would come from a wide area where hydrogen would be, Hydrogen is the lightest element, so it would float up and fill the reactor building from the top down. If it truly was a hydrogen explosion, and it wasn't, then the blast would come from the top down. The fuels would be compressed into their deep containments, not launched thousands of feet into the air as did occur. I am going to stop calling these things reactor vessels, and instead call them "Radiation Cannons"
This Prompt criticality doubles in power every millionth of a second and causes incredibly rapid power increase that is the destructive nature of a bomb. The second type of prompt criticality is called a prompt MODERATED criticality, which is what I believed happened at Fukushima. One thing to note, the nuclear promoters know that plutonium is a dirty word, and many laymen know how dangerous plutonium is. 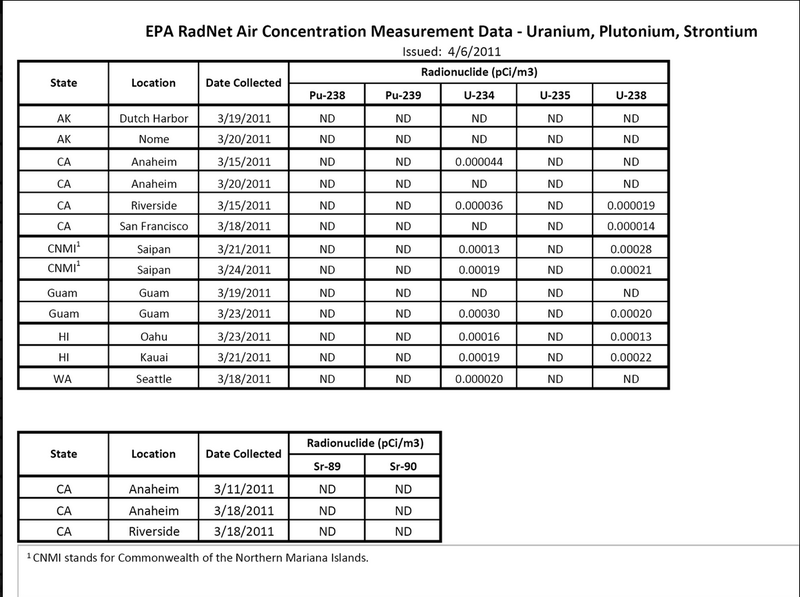 In the table above, EPA states ND supposedly for "None Detected" but in reality, that is a lie as the real story was "not tested". 3 facts: in reactors, as uranium burns, it turns into some percentage of plutonium. Also any "spent fuel" will therefore also contain plutonium. And finally in Reactor, aka Radiation Canon 3, they were using MOX fuel which is a uranium with highly concentrated Plutonium. The nuclear promoters try to lie to cover up their dirty little secrets, to protect "their precious". 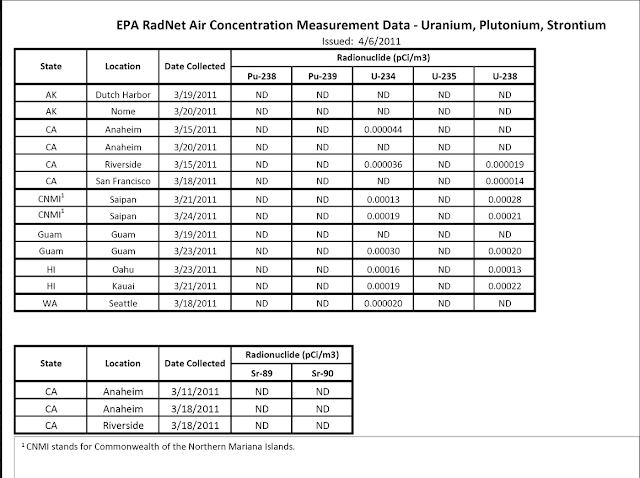 Bottom line....if there is uranium in the air, there is plutonium in the air. Below you find 3 separate sources proving the Plutonium detected in USA and even as far as Lithuania. Just today, ENENEWS broke an article showing plutonium in New Mexico with the Fukushima "signature"
And just for good measure, here is the video of Radiation Canon 3 exploding. Note the huge chunk of steel/concrete that was launched upward, and the apex, it falls off to the left. Wouldn't it be better to remove the Radiation Cannons from your Backyard? Remove them all from the HOME PLANET. Now, why do you think that they are claiming nothing happened at Fukushima, and nothing harmful came out? They cannot afford to let you know the horrible truth of what happened. Toxicity of both Uranium and Plutonium are functions of their radioactivity AND even more importantly, they are highly toxic heavy metals. Their One-Two punch is a killer. A 1996 testing of 144 Beagles given inhaled Plutonium killed 141 of the dogs within 1.5 to 5.4 years. Bone tumors killed 93, Lung tumors killed 46, and liver tumors killed 2 (although liver tumors were found in 20 dogs, just that the Bone and Lung killed quicker). Maybe we ought to stop putting this stuff into Radiation Cannons? YES SIR!!!! Reactor 3 was most defiantly a PC ( Prompt Criticality) event!!! All one has to do is look at the photographic, video and levels of rad contamination to show that this actually happened, text book true! MOX is the deriding factor in this one and it's a "no brainer" if you honestly look at it with any complicated blinders off. Look up the factual time line and the years of research data that support this conclusion!!! A simple explanation of the evidence (and the truth). Yes it was a nuclear explosion. We did the math here on March 31, 2011 and showed in the Fukushima Mega-thread that a nuclear detonation occurred. How much energy is required to raise both the refueling crane and reactor vessel cover to a height of 450 feet? It would require 10,968,750 horse power (HP); by assuming the height of the hydrogen vent tower to be 150 feet, the reactor containment vessel top appears to have gone two and one-half times higher or 450 feet; The top of the reactor vessel weighs 2000 tons. It requires 12.1875 HP to raise one ton in one second. So we needed 10,968,750 HP to raise 2000 tons 450 feet in one second. 1 HP = 0.000641615568281 tons of TNT or we have 7037.7 tons of TNT. You have further force required to raise the refueling crane to that same 450 feet of height. It was instantly obvious to any observer with a rudimentary knowledge of Physics that this was an explosion possessing force that could in no way be the result of a steam explosion. The released happened from the 3/14 nuclear detonation at Unit #3, the big one, the one I keep describing. Short version: MOX core melts, accumulates in layers on the concrete pad, distinct layers of each isotope in the molten mass by specific gravity. Uranium and plutonium layers hugging each other across the pad. And the shockwave from hydrogen deflagration, instantaneous mixture of the uranium and plutonium along the horizontal plane. Horizontal criticality with massive neutron pulse at sea level along the plane of cascade detonation. Xe 133 is made in vast quantities, exabequerels of it, and mortared up into the atmosphere, carrying along with it the uranium, plutonium, cesium, iodine, strontium and the rest of the layers in vapor or gas form. Add to the the effect this criticality had on the SFP, adding the second volley, which was mostly cesium, iodine, strontium and other byproducts. Afterwards, both the reactor and the SFP were seen emitting gasses hotter than 250°F. This was also mostly cesium, iodine, and strontium class. Most of the Xe 133 was created and delivered from the criticality. Stations in the US were spiking like crazy with the xenon, in the 100kbq > 1mbq range from 4/16 to 4/20. No one in the US was spared exposure. It went everywhere. Bang Bang Bang… You nailed it dosdos. Anyone who believes that the explosion at R3 was simply hydrogen is easily fooled, and the nucleocrats like 'em that way. Thanks, this simple as the nose on your face analysis makes it obvious. We been dosed in the biggest ever spread of the worst of radioactive heavy metals. I don't even know what to say after reading this article. You can't seem to articulate one coherent concept and none of your thought make any sense. Also the video you linked is to safety tests performed by Argon National Laboritories and demonstrates how boiling water reactors are inherently safe by producing steam which reduces their reactivity coefficients. LOL a Troll! I have hit the big time, LOL. Please use an S after thought for thoughts. Also, it is called Argonne National Labs. Not Argon. You use Argon for welding. Although they call it a "safety test" it is really just an ego pumping "watch we can make them blow up real good" test. Open air no less. No its doesnt show them as being inherently safe. It shows them as being capable of blowing up in a runaway criticality. You must be illiterate if you found yourself lost for words after attempting to read this article! The tests at Argonne Labs were done to show that a runaway chain reaction could easily cause a critical detonation in the reactor vessel! 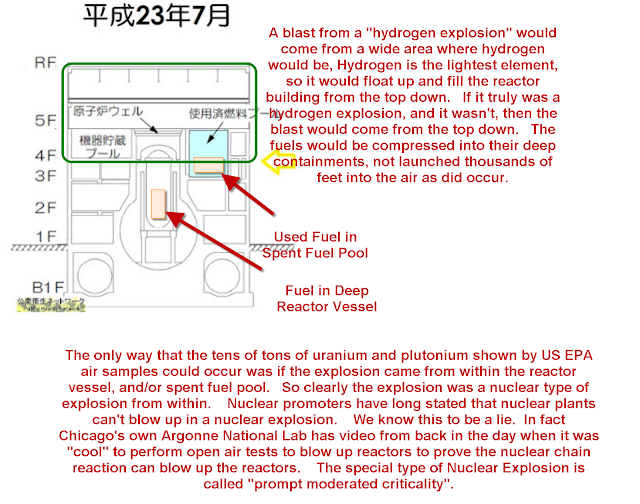 Just what exactly happened at the number 3 MOX fuel reactor at Fukushima! How else could pieces of fuel rods been found several Kms away from the reactor? You are the lowest type of troll, one who drivels gibberish that somehow tries to confuse people of just how catastrophic this event is all for the nuclear industry to continue profiting from the death of the planet and it's inhabitants. Nice reply Mike, Troll it is. There were no "pieces of fuel rods been found several Kms away from the reactor". When I first heard that rumour I looked everywhere for corroboration, but with no result. I think it's a misinterpretation of a report that found minute quantities of Pu, and they were trying to identify if it came from Fukushima or not. If anyone has a good source that contradicts this, I'd love to read it. @anon, Plutonium was found all over the world related to Fukushima, and it had the right "signature" to verify it wasn't older plutonium from other accidents and explosions. Anne compiled a bunch of resources. 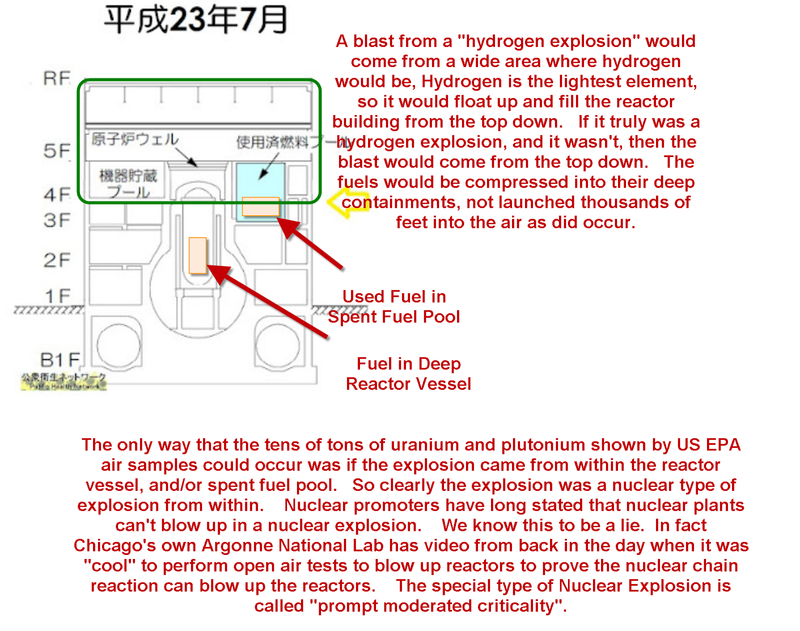 Fuel rods are obviously laying in the rubble, look at the top picture of this blog. Apparently you haven't done your research. The rods in the rubble are exactly like the experimental nuclear fuels that the French have been creating. Oh and does your average pipe have "closed ends" in 6" segments.....hmmmm, these aren't pieces of pipes that have been blown to pieces, and have nicely cut ends that also happened to "close up". Sorry dude, you are treading on pro nuke troll grounds already. Oh wait....did you say pellets....I thought rods were only long and thin, oh you mean the outer casing and not just the fuel inside. Sorry dude, you been busted again. Check out these rods...exactly the same thing as what is in the rubble. And check out the "rust paths" in the rubble. Now what is your theory on those? The above calculation is WRONG!!! First the statement that 1 HP = some amount of TNT equivalent is NOT dimensionally correct. HP is a unit of power and TNT equivalent is a unit of energy. So you have power = energy which is WRONG. Power is the rate of energy = energy per time. Actually, this proves the explosion was NOT nuclear. Nuclear explosions destroy entire cities; the Unit 3 explosion didn't even destroy the building. You've GOT to be joking, right? The building wasn't destroyed? Please watch these videos then tell us if you still think the Reactor 3 building and containment wasn't totally annihilated. @Not Crazy, indeed the commenter above has done some calcs, and has completely missed the point. A moderated prompt criticality is a nuclear explosion, which is different than a nuclear bomb explosion which is designed for a particular effect (really big boom). His calc is "less than the smallest possible " completely ignoring the difference between a nuclear bomb and a prompt moderated criticality, the same DISINGENUOUS mistake that he makes while stating that a nuclear explosion destroy whole cities. Sad how even those with some engineering training completely lie and miss the point to protect "their precious" technology. That troll should be the 1st one to die from radioative poison. He deserve it! Well Dude, you got it about25% right. How does an completly empty reactor- the mox explode? search the www for JIM STONE- read about what REALLY happened. No you got it wrong. Reactor 3 was full, reactor 4 was empty. It is courteous to provide a link if you have a rabbit hole to run down. http://www.jimstonefreelance.com/.......Click on FUKUSHIMA after checking out the front page for the new photos of the Fu site. Jim Stone has an agenda and an ax to grind, and although he does good research and has uncovered some useful things, his willingness to depart from reality to gain hits makes everything he does have to be taken with a grain of salt. Go away freak-troll. Retarded globalist shill. They knew BEFORE one was ever built how volatile these were and built them anyway! Bottom line, as usual, the "almighty buck"!!!!! I think its the buck, but in case of nuke....also the power trip of big bombs, and the ego of the godlike game of changing matter into energy. Not to mention the economic hitman of the military industrial complex (aka the buck). Thanks for the comment! Yep, people think that the only risk of radiation is "cancer, somewhere far in the future", and that is not true, it brings on a lot of near term sicknesses, and weakens the body to defend against "native stuff" in our environment that we would otherwise just shrug off. How much you want to bet these 25 sick school kids recently did a school trip to a shoreline area? 1 millionth of a gram of Plutonium is enough to kill 1 human. After it can be absorbed by other animals / humans since it stays radioactive for very time. Thats not safe! I see, the Manhattan project secretly gave him almost a full micro gram of P238 and P239, and it did kill him, although it didn't give him cancer. Just shows how evil the nukers are. How about them beagles with inhalation rather than injection? 100% death in 1.4 to 5.2 years and ALL died of cancer or disease directly related to the Pu inhalation. It's actually due to the radiolytic decomposition of water; with a sufficient neutron flux to break water apart - present in nuclear reactors at all times - and without a sufficient gamma flux - present only during criticality (which is perfectly fine - a uranium reactor is "critical" when it's operating at power, it's not a bad thing at all, "prompt-critical" is the one you worry about). Without sufficient chemistry control (i.e. no one was in the plant to do it) there wasn't enough of an oxygen-scavenger in the coolant to get rid of all of the oxygen. Due to the melt-down, contamination was present within the reactor coolant; when they went to relieve pressure, the hydrogen and oxygen combined in the air - when you do it properly, it creates water. When you don't, it creates an explosion, which, along with the fact that they were relieving over a thousand-pounds of pressure to actually propel the contaminated coolant to that explosion point, and the fact that it was over a thousand points of pressure being that it will act like an explosion on it's own, you get a large amount of contamination spread. Still better than a nuclear explosion. To believe that, I'd like you to show me the physics on it. Considering I'm probably the only one who's viewed this webpage that actually knows the physics, I'll be waiting a while. Oh I see, they were inside the reactor building, doing the manual vent, and it exploded, but no one died. I see, it all makes sense now. Quoting you "A thousand points of pressure" hmmm you aren't stating your point clearly, your statements ramble without coherency. How is "a thousand pounds of pressure," not coherent? How about over 1000psig? That more coherent for you? How about this: Boiling Water Reactors have to get hot, and still have to use liquid water. This means they have to be at a very high pressure. Sometimes, that pressure gets too high, specifically during a melt-down, and you have to relieve that pressure. When you do, it causes a massive hydraulic-shock to the plant, dislodging contaminated particulate. This massive pressure release essentially sucked out a lot of this "CRUD," (named for Chalk River Unidentified Deposits) and blew it into the atmosphere. Bad day, but not as bad as it could be. Also, I'm not as familiar with the GE-BWR-3 & 4s as I like. Being "inside the reactor building," and being "inside the reactor compartment," are entirely different statements. Especially as they weren't inside the reactor compartment, they were inside the reactor building. The RC is inside of the "reactor building," just as your kitchen is inside of your house. If you just so happen to have several feet of water and steel between you and your kitchen when there's an explosion inside your kitchen, it's perfectly logical that you could survive the blast, especially when that shielding is designed for that purpose. So I don't see why you're being so sarcastic about people being able to survive a massive pressure/hydrogen explosion when they were behind shielding designed to be able to do just that - keep them alive in such a case. "Manual Vent," doesn't have to be "local", either. There are also "Remote-Manual" procedures, which involve using a series of valves to lift other valves, i.e. some valves are controlled by other air valves, which are often controlled electrically (or, for your understanding, that would NOT be considered manual), or the air-control valves can be controlled by hand (manually) to lift other the other valves that actually release the pressure. In fact, this is a common design to ensure redundant safety in reactor plants. Even in the event that these valves that actually release the pressure/hydrogen must be operated by hand, that is not to say that the source of the explosion will originate at the valve; the piping downstream of the valve can vent to another room. So, yes, it all does make sense. Turns out people thought about these things. I'd still very much love to see you, or anyone else for that matter, try to actually explain how poorly-enriched U-238 causes a nuclear explosion. That'd be fun. Wow me. "In the event" in your third last tome, indeed that was the case in Fukushima and they had to manually operate. In fact, they were trying to buy car batteries to replace the battery backup system, but they werent sure the purchase would be approved by corporate TEPCO, so they didnt, and explosions resulted. Jesus, save these poor humans who think like that. And those who try to cover up. You knew that right? And they didn't even do the basic mods that were done in the US. Basic obvious stuff. Instead, because the internal lined of the reactor canon was getting destroyed they replaced the shrouds and used that as an economic hitman approach to justify putting MOX into R3 and R4. Jesus! Greed! is a reaction by-product ? It occurs naturally in the earth's core . maybe no evil intent , just stupid . Very little Pu239 exists "naturally", only the "natural" OKLO fissioning event produced Pu239, and that was many half-lives ago. More Pu exists than you think. Neutron capture ib natural uranium makes plutonium. You can do the math. How much natural uranium do you think exists on the planet? Oklo is the bane of the antinuke. You know Gundersen isn't a criticality expert. That was no crit. Ask hi m where were the 1e19 neutrons over a millisecond. Every battery powered hand held meter would have pegged as the criticality accident history shows. 1. The spent fuel pool. 2. The northwest corner, where the floor is completely blown upward and outward from an explosion on the floor below. The large chunks of material seen falling from the explosion are the sections of concrete flooring. If that enormous explosion had been generated from the reactor vessel the roof framework would be blown away over it. It is impossible for the upward blast to have passed through the roof and leave the framework intact - and also to still be able to hold water and produce steam. 2. Vertical exp. in the nw corner, blowing out the walls on the lower floor, with most of its force directed upward. I don't think that either of these events was planned specifically, except by arrogance, ignorance, and greed. However, nuclear can be a country/society killer. Im fairly sure we are terraforming this mud ball for it's future inhabitants......thanks and appreciate a brake down of the dynamics in this "process".... only rational explanation. It is odd for sure, and just because Occam has a cool name doesn't mean his razor cuts to the truth. Just as a new troll has entered ENENEWS, ExpertNuke, a troll or trolls have also attacked this site, under the pretense of presenting "facts" but simply promoting a pro nuke stance. I have been forced to restrict annoymous comments, if you won't stand behind your statements, you won't have a voice at MY SITE. How much Plutonium did these dogs inhale, exactly? Again, trying to explain nuclear danger to others who won't listen. About 350 micrograms is a "pretty sure kill". Some people say 1 microgram is enough to kill. Well thats true, even I microgram could start a cancer that killed, but it is not likely to. Ill say it again. Unit 3 was not a prompt moderated criticality. The neutron flux from such an event would have sent many to the hospital. Turd, 5 took lethal doses, ON THE DAY of unit 3 explosion. Therein lies your proof. if a hydrogen explosion occured it would have exploded from the top down as hydrogen floats. A top down explosion they claim cannot fling material up into the air. I'm no expert but imagine this. Get a metal barrel. Fill it say 90% with water or sand. Cover the entire mouth of the barrel with paper. Place a small explosive device on top of the paper and ignite the explosive. Vince, now adjust your thought experiement. Fill the vessel only 20% of the way, and make the vessel pretty tall compared to overall volume. Now do your blast. Does more than half of it fly out? Its now the 31st October 2014, and the troll who said "no pieces of fuel rods" has been proven wrong. Even main stream corporate media, who are usually the last to find out, have admitted this. NHK have also stated that the rods were blasted at least 130km away. It just goes to show: the truth always comes out in the end. I dont understand the calculation arriving at 7 kilotons to raise the roof. The units dont even make sense. Look, 2000 tones are 2 million kilos, it takes roughly 20 million joules to raise that 1 meter, 450 feet are 150 meters, roughly, so multiply 20 million joules by 150 meters and we end up with 3000 million joules, 3 Gigajoules. Now, one ton of tnt has an energy of around 4.2 megajoules, and only takes 0.67 tonnes, not kilotonnes but bare tonnes, to provide that kind of energy. Your are off by 4 orders of magnitude. Sadly, whether a fission reactor is operating with Thorium fuel pellets (Silicon Carbide clad), accelerator-driven Thorium reactor (with Bismuth spalation target) or some other type of conventional nuclear reactor using fuel rod bundles, when spatial integrity is lost within a nuclear reactor core, all assumptions regarding the spatial separation between fuel rods no longer pertains. When spatial crowding of fuel rods occurs, that is when a moderated prompt criticality can occur. Unintentional criticalities can also potentially occur in the spent-fuel-rod storage pools, for example at Fukushima, or at various plants in France, the UK and USA where vast quantities of spent nuclear fuel rods are presently being stored. Sadly, there is no alternative but to admit that conventional fission nuclear power is inherently highly dangerous, uninsurable for accidents (borne at governmental level by tax payers) and leaves vasts amounts of dangerous waste (estimated 158000 tonnes of high-level nuclear waste presently around the World). Thorium LFTR or other types of MSR could allow, if technologically developed, this nuclear waste to be transmuted to something safer and more benign to the environment, but there is no interest at governmental or institutional level to invest in such activities, as the World drowns in debt and the present World banking system (like a huge ponzi scheme) is progressing towards melt-down because of its lack of sustainability and inherent internal self-contradictions. Only in a post economic meltdown scenario of the present international financial system (WallStreet et al. ), when a new economic order is established that values environmental quality, will the necessary resources be devoted to actually dealing with the horrendous legacy of pollution that has been inflicted upon the Earth during the past 60 years: In Japan, 50 years of nuclear power, 500000 years of nuclear contamination (rather a Faustian bargain ?). I hope that the senior oligarchs within Bilderberg are properly aware of the situation and act wisely in future. This is the most conspiracy-ridden pseudo-scientific misinformation I've ever seen. But everyone on here is reading this particular website because they want to read something with a predisposed tilt. I'm not going to try to change your minds. What a joke, you have presented no rebuttal at all. You simply play the "conspiracy card". What is presented in the article is all facts, no opinions, no conspiracies. This is reality, not at all like the "HAARP caused earthquake, conspiracy"
Consider this, 3 explosive sounds at R3. First the plutonium drops out of the vessel, stratified as you say, a blast, setting off a hydrogen blast, which penetrates deep into the reactor vessel, setting off the third biggest prompt critical, blowing tens or hundreds of tons of concrete into the air, 1000 feet higher or more. Quality content is the main to be a focus for the users to pay a quick visit the web page, that's what this website is providing.